I’m a relentless (probably to the point of being annoying) proponent of tax competition among jurisdictions. It’s one of the reasons why I favor tax havens and federalism. Simply stated, politicians are less likely to do bad things when they know economic activity can escape to places with better policy. And I’m more than happy to pontificate on the theories that support my position. But every so often it helps to have a powerful real-world example. Our example today deals with the fact that the United Kingdom has a very punitive tax on air passengers, but the U.K. government also is devolving some powers to regions such as Scotland. And this bit of decentralization is already generating some pressure for tax reductions. Here are excerpts from a story in Scotland’s Herald. "The UK government’s decision to devolve control of Air Passenger Duty (APD) to Holyrood means that a family of four could eventually be saving as much as £388 for a one-way journey to long-haul destinations. The promise to hand the Scottish Government control of APD is part of the UK government’s devolution package… The Scottish Government last week said it would halve the rate within the next Parliament and abolish completely “when the public finances allow”." That sounds like good news for travelers, but some folks aren’t happy. "…airports as well as tourism bodies south of the border are up in arms, fearing that it will create an uneven playing field for the aviation sector as passengers in the catchment areas of airports such as Newcastle, Manchester and Liverpool will simply drive across the border to rival airports in Scotland to avoid potentially huge APD costs. "Newcastle airport’s planning director Graeme Mason told the Sunday Herald that Scotland cutting or scrapping the passenger levy would create an unfair “cross-border market distortion” that would fester unless the UK government matches any reduction in APD south of the border." But what he (and others) refer to as a “distortion” is actually the healthy process of competition. Just as the I-Phone was a “distortion” for the Blackberry, but very good news for consumers. Just as the personal computer was a “distortion” for the typewriter industry, but very good news for consumers. Countries, just like companies, should suffer when they don’t provide good value in exchange for people’s hard-earned money. Here’s more from the story, including the fact that English airports in the long run will probably benefit because the government will now feel pressure to lower the tax burden on air travel. "…anyone travelling long-haul could potentially save themselves hundreds of pounds. The saving could be enough, for example, to undermine direct flights between Newcastle and New York that are set to launch in the May. But in Scotland, the decision to devolve APD to Holyrood has been greeted with delight by airports, the tourist industry and businesses which have campaigned both before and since the independence referendum to get rid of the tax. "And many of those behind the campaign say that airports in England will eventually benefit from the abolition of the tax in Scotland, as this increases pressure on the UK government to follow suit." 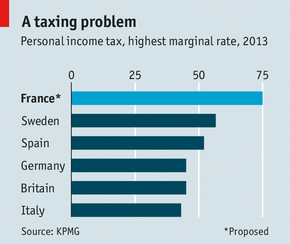 Here’s some real-world evidence of tax competition promoting better policy on travel taxes. "After introducing a form of APD in 2008 the Dutch government scrapped the tax within a year after Dutch residents started travelling in their droves to airports in neighbouring Germany to avoid the tax. Belgium, Denmark, Malta and Norway have also scrapped flight taxes for similar reasons. "That leaves the UK as one of only five countries in Europe to levy a passenger departure tax (the others being Austria, France, Germany and Italy) but the UK tax is, on average, five times higher than those other countries and is thought to be the highest in the world… In 2011 the UK government was forced to slash APD on long-haul flights in Northern Ireland, to stem the flow of passengers travelling south to Dublin to take advantage of the Republic of Ireland’s low and now abolished tax on flights." By the way, the story also reminds us about how dangerous it is to give a government a new source of revenue. "Air Passenger Duty (APD) was introduced by John Major’s UK Conservative government in 1994. It was originally payable at just £5 for one-way domestic and European flights and £10 elsewhere but it has become a nice little earner for successive governments who have steadily increased the levy to the point that it is now the highest tax of its kind anywhere in the world. "Long-haul flights in the cheapest economy class are now charged between £67 and £94 per flight, depending on the distance travelled. Other classes of travel, including so-called premium economy class, are charged between £138 and £194 per long-haul flight while anyone travelling in a small plane is charged between £276 and £388 per flight." Just keep all this data in mind the next time someone tells you we should let politicians impose a VAT, an energy tax, or a financial tax. Since we’re on the topic of tax competition, let’s look at the tennis world to see how taxes drive behavior. In her column for the Wall Street Journal, Allysia Finley explains that top tennis players respond to fiscal incentives. "…tennis players respond to economic incentives and often act as strategically off the court as on. For the past three years Spain’s Rafael Nadal…has bowed out of England’s annual Queen’s Club tournament, traditionally a Wimbledon warm-up, because the U.K. charges foreign athletes a prorated tax on their world-wide income (including endorsements). The more tournaments he plays in Britain, the more he owes Her Majesty’s Government." Heck, those U.K. tax laws on worldwide income are so powerful (in a bad way) that they even chased away the world’s fastest man. So what nations offer a more hospitable environment? Two of my favorite places, Monaco and Switzerland, are high on the list. "The top five French players on the men’s circuit— Jo-Wilfried Tsonga, Gael Monfils, Gilles Simon, Julien Benneteau and Richard Gasquet, as well as Germany’s Philipp Kohlschreiber, all claim residence in Switzerland, ostensibly to avoid paying their home countries’ punitive 45% top personal income-tax rates (not including surcharges or social-security contributions). …the most popular haven for tennis players is the principality of Monaco, which doesn’t tax foreigners’ world-wide income. "…Swedish tennis legends Bjorn Borg and Mats Wilander escaped to Monte Carlo during their primes in the 1970s and ’80s to dodge their home country’s 90% top marginal rate, which has since fallen to 57%. …Today, Monaco is the putative home of many of the world’s top-ranked men and women players. They include Serbia’s Novak Djokovic (1), the Czech Republic’s Petra Kvitova (4), Tomas Berdych (7) and Lucie Safarova (16); Canada’s Milos Raonic (8); Denmark’s Caroline Wozniacki (8); Bulgaria’s Grigor Dimitrov (11); and Ukraine’s Alexandr Dolgopolov (23). Players who hail from former communist countries are especially keen, it seems, on keeping their hard-earned money." Even inside the United States, we see the benefits of tax competition. Florida is one of the big winners and California is a big loser. "The U.S. has its own Monaco: no-income-tax Florida. It’s no coincidence that America’s top-ranked players Serena (1) and Venus Williams (18) and John Isner (21), as well as Russia’s Maria Sharapova (2) and Japan’s Kei Nishikori (5) live in the Sunshine State. So do twins Mike and Bob Bryan, who have won 16 Grand Slam doubles titles. Like the Williamses, they come from California, where the 13.3% state income-tax rate is the nation’s highest." Indeed, it’s not just tennis players. Golfers like Tiger Woods have Florida residency. And those that remain in California are plotting their escapes. Even soccer players become supply-side economists! So whether it’s taxpayers escaping from France or from New Jersey, tax competition is a wonderful and necessary restraint on the greed of politicians.